The wait is finally over, viewers! Season 9 of The Real Housewives of New Jersey began last night, and as always, the ladies of the Garden State did not disappoint! When we picked up with the Jersey girls, we were treated to a preview of a nasty battle between sisters-in-law/mortal enemies (it depends on the day), Teresa and Melissa. Of course, just as it started getting juicy, the show rewound to 3 months prior, but the good news is, we viewers will get a front row seat to exactly what led up to the renewal of this Battle Royale. Anyway, three months before the showdown, Teresa found herself making a seamless adjustment to her husband Joe’s absence. As viewers are surely well aware, Joe is still in the clink, serving a three year sentence for bankruptcy fraud and other charges. Of course, he’s also set to be deported once his time is served, but Teresa seems determined not to let those pesky little facts get in the way of living her best life. Teresa was gearing up to participate in a bikini fitness competition. What even is that, you ask? Well, apparently it’s a horrific contest, in which you starve yourself, abstain from all alcoholic beverages, and work out like a dog until you’re lithe enough to fit into a tiny bikini, at which point you then strut out on a stage for people to judge you. Sounds like a good time, right?! Teresa seems to think so. She said that she’s been wanting to do this for years, but that Joe always said no, and that now that he wasn’t there to rain on her parade, she was going to go for it. Of course, he has no idea it’s happening, and probably won’t until it’s over, since Teresa said she and the girls only see him every six weeks, or so. And speaking of Joes who like to boss around their wives, Margaret’s husband, Joe, told her that he didn’t want her getting a facelift, so naturally, she sent her mother, Marge Senior to have one in her stead. But that wasn’t all. Since she was having the upstairs remodeled, Margaret talked her into fixing up the downstairs, too, so she had vaginal rejuvenation surgery, as well because, really, what else does a septuagenarian have to do on a Wednesday afternoon? In the meantime, Dolores seemed to be missing having a bossy man around the house. She’s still living and working with her ex-husband, Frank, in what must be the most unorthodox divorce on earth, but he spends most of his time in Florida these days and Dolores is feeling the “Empty Nest Syndrome.” Now, Frank’s time in Florida may be related to the fact that he’s no longer allowed to practice law in New Jersey. Of course, I also think there’s a clause in the Constitution that says all aging New York bodybuilders must eventually retire to Florida, so at least he’s in compliance with that. His legal practices, not so much. He’s been disbarred for “misappropriating client escrow funds,” and well, that sort of thing is frowned upon–even in Jersey. Who knew? This bit of news has been under wraps for quite some time, and Dolores not only flat out denied it when asked about it during last season’s reunion, she acted as if such a thing were absolutely preposterous. Of course, she says now that she had no idea what Frank was up to, and that, in fact, he had lied to her about what was really going on. And who knows? That could be absolutely true. After all, a lawyer that would allegedly steal from his clients surely wouldn’t balk at telling a a few lies to his ex-wife. But Dolores is still by his side, and the former spouses are now running their gyms, as well as flipping homes together again. Makes you wonder what Dave has to say. Ah, yes, remember poor Dave? Dolores is still with him, believe it, or not, although she said they don’t spend as much time together as she’d like. Gee, I wonder why?! Now, I think we all became very well aware of the fact that in Italian culture, you do not, must not, can not, discuss, ask about, or otherwise gossip about, a friend’s legal problems, as Teresa was preparing for her um–time away. Lord knows if anyone asks her about it to this very day, she’s ready to flip the nearest table, and it’s not as though the whole world isn’t fully aware of every last detail of the whole ordeal. So she understood completely that Dolores was not going to want to discuss it. But apparently Danielle didn’t get the memo, or maybe she just doesn’t care because she hates Dolores, but either way, she’d been doing a lot of talking about Frank’s predicament. Luckily for Dolores, she and Teresa go back to pig tails and tricycles, and besides, Dolores is truly a loyal friend. When she and Teresa met for lunch, she actually offered to eat the same thing that Teresa was–and she’s not even allowed to have carrots–let alone pasta or cheese! If your bff isn’t down for you like that, find a new one! Anyway, Teresa told her all about the things Danielle had been saying, and Dolores became furious, of course, and told Teresa to advise her friend to STFU. It was sound advice, too, considering they were all going to be seeing each other at Melissa’s 39th birthday bash. Dolores does not play, and when she informed Frank about the things Danielle had been saying about him, he seemed supremely unbothered, and simply asked that whatever Dolores was going to do to Danielle, could she please wait until he had gotten something to eat first. We also met two housewives during Melissa’s party, Jackie and Jennifer. Jackie, a long time friend of Margaret’s, describes herself as the type who can go from “fun drunk” to “bad drunk” pretty quickly. Jennifer, on the other hand, is much more reserved and WAY more old school. She was just about to enter into an arranged marriage back in her native Turkey, when she met her current husband, a plastic surgeon that Dolores used to work for. She described the first time she met him and despite the lightning bolt she felt (or perhaps because of it) she insisted on a chaperone for their first date. We were also reacquainted with Drunk Melissa at the party. She’s usually good for some fun and always, always messy! Last night, she was in rare form, and, for some reason, insisted upon reliving some of last season’s most cringeworthy moments, including asking everyone to throw the cake Joe got her, in an effort to show that she’s nothing like Siggy, and telling him, quite loudly that now she brings home the cake, and he brings the crumbs, and that she’s “successful b****,” which harkened back to a particularly awkward moment between the couple, during which Joe seemed to degrade the financial contribution his wife made to the family. Well, the show faded to black from there, but buckle up, viewers, we’re just getting started! 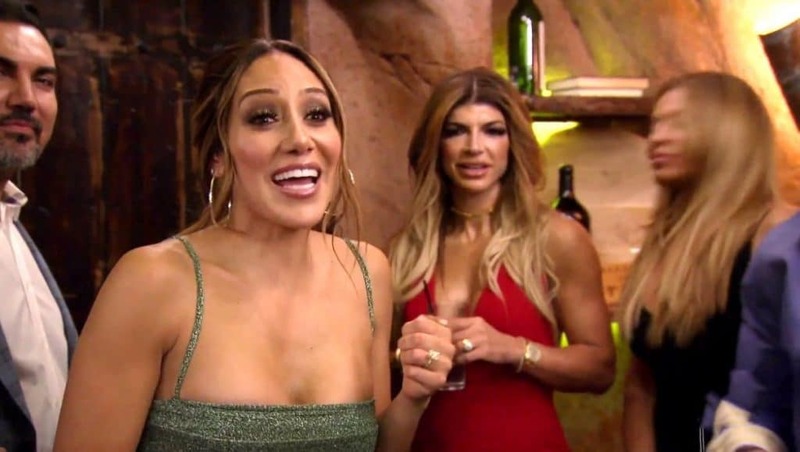 Scenes from this season show the new girls picking sides, Teresa and Melissa reigniting their feud, and since it wouldn’t be RHONJ unless something got broken, plenty of broken flatware. Stay tuned!